Sea ice is disappearing. That's not just bad news for polar bears. When Fridtjof Nansen and his Fram-expedition were stopped by a wasteland of frozen ice on their way to the North Pole, it was also the definitive refutation of an old and curious idea that there had to be a large area of open water at the center of the Arctic Ocean. 120 years later, an ice-free North Pole doesn't seem far-fetched anymore: this month sea ice reached its second lowest minimum ever measured, a continuation of the downward spiral in which the frozen top of our world has found itself for the past two decades. The consequences range from the local to the global. Polar bears have less ice to hunt on, and need to spend more time on land, where they wait - starved for food - for the ice to return. In principal, these water-loving animals can swim towards the ice, since they can do so for days on end, sometimes for hundreds of kilometers. Or at least, a full-grown polar bear. Whether their cubs can travel the extra distance to the ice remains an open question. The WWF can wonder, now that the panda officially isn't endangered anymore, whether they should remove the black from their logo. These days, an ice-free North Pole doesn't seem far-fetched anymore. But besides the iconic image of a polar bear on a melting ice floe, there are also other, less apparent consequences of the disappearing ice. The disappearance of the white ocean cover is like the removal of a mirror. This leads to more absorption of sunlight by the ocean, and higher temperatures. This rapid warming of the Arctic has far-reaching consequences further to the South, for our weather and climate. Recent research, for example, has suggested a link between disappearing sea ice, a warmer North Pole, and extreme weather in our surroundings. It isn't entirely clear yet how this functions, because the natural variation in the weather is large, but a leading theory is that it's related to a weaker jet stream - the winds on which airplanes tag along to save fuel. These flows are formed because of wind blowing from the warm South to the cold North Pole, and gets deflected towards the East by the rotation of the earth. When there's a strong temperature difference between the Arctic and the South, the wind between these two areas intensifies, and the jet stream becomes stronger. When it is strong enough, it forms a barrier around the north pole region that prevents cold air from suddenly escaping towards the south: the polar vortex. Vice versa, a lower temperature difference between North and South, due to a warmer Arctic as a consequence of less sea ice, leads to a weaker jet stream and this makes it more wavy. Because of this, a loop of cold air can form with which the polar vortex stretches out over Scandinavia and Central Europe, or parts of the US. Moreover, the weaker jet stream makes these loops move slowly, which causes the same cold weather to stick to the same location for a prolonged period of time. 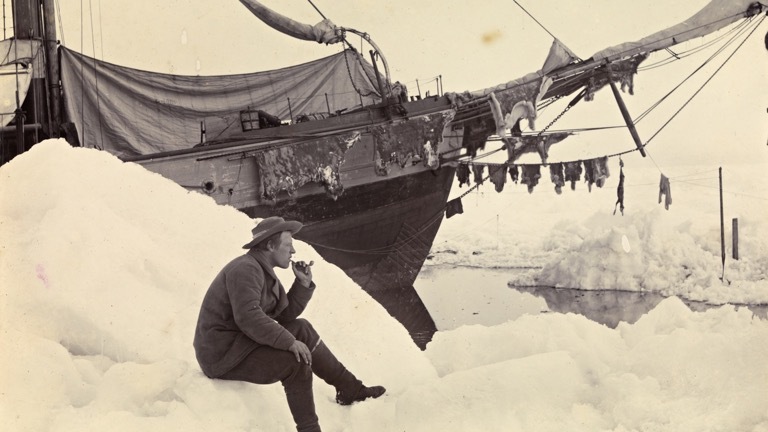 Fridtjof Nansen survived several long Arctic winters when he tried to reach the North Pole with the ship 'Fram'. Here he's smoking a pipe in June 1894. This behaviour of the polar vortex has been linked to several extreme weather events in the past few years, in Europe and the US, where snow storms appeared much further south than normal. And while it was incredibly cold in New York or Berlin during these events, it was often ridiculously warm in the Arctic. But apart from abnormal weather, a warmer Arctic is also bad news in other ways. The disappearance of sea ice has made the Arctic coast more vulnerable for storms, which is why whole villages in the Arctic will have to move. Permafrost thaws, which may increase the release of greenhouse gases, and plants start to blossom too soon, which disturbs migration patterns of animals. The production of our goods in factories, the daily commute by car, or a flight to a distant destination all contribute to the melting of ice in the Arctic Ocean, which has set in motion a chain reaction that can't be stopped easily. It's not like we only just found out about all of this. In april 1896, the Swedish scientist Svante Arrhenius published the very first article that showed that CO2 raises the world's temperature. At the very same moment, on a deserted Arctic island, Nansen had been battling the vicious Arctic winter for over eight months. Beaten by the sea ice, waiting for the coming spring.